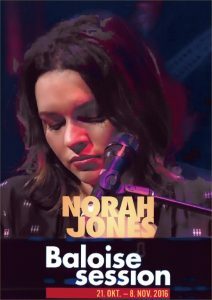 Recognized Jazz singer Norah Jones performed at the Baloise Session music festival held in Basel, Switzerland on November 7, 2016. The concert was aired by the Arte channel on February, 2017. A fusion of styles as well as different genres were mixed in this concert highlight the vocal, piano and guitar talent of Norah. Her voice fits every genre of music and she certainly proves it by using these varieties in her live performances and recorded albums. In this particular performance, Norah uses her classical jazz style with fusions of blues and blue-eyed soul. There are also blends of country and pop in some of the pieces. Although is was not a virtuosic performance as we expect from a jazz concert, she pulled it off by the beautiful timbre of her voice, which has an excellent way of interpretation. Norah begins the performance with “Day breaks“, a song that titles her last album released in October, 2016. A fusion of jazz harmony with a steady rock pop rhythm makes of this song an interesting piece. 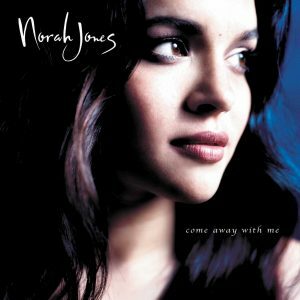 Perhaps the most relevant album of Norah’s career “Come away with me” have a series of songs people were expecting to hear. On the second track of this concert, she sings “I’ve got to see you again“, a fusion jazz piece that includes the mellow combination of musical factors that interpret the need to see the person she loves. A rhythm going constantly with a few syncopated chords from the piano and some motifs now and then, helps set the scene. An ambient guitar with doubles the piano solo in echo, a quiet bass almost silent, sets the platform for Norah’s voice to stand out. She puts the bluesy mellow tone in her vocal performance allowing the piece to be felt. Jones performed other hits such as “Burn“, “Out on the Road“, “Tragedy“, “Sunrise“, “Don’t Know Why“, among others. This was a concert with moments of emotion and sparks but it was not 100% spectacular. Jones is not the most expressive person on stage which is particularity strange due to the sweetness of her voice. The other musicians were not great at all. There was no Jazz coming out of them. They sounded more like pop musicians than Jazz, which kills the flavor of it. She should’ve stick with one genre, either Jazz or Pop, but the mixture didn’t work in this case. In general it was pulled off thanks to her talent, but it could’ve been marvelous. Lots of fusions are arising nowadays, some of them work other don’t but it’s always good to explore new venues. The key element is having the right people to perform, because that will affect no matter how talent the artist is. Norah sounds way better in other performances and recordings, specially when she is accompanied by great musicians. Although this was not her best performance it does not devalue her talent. She is an amazing singer and musician and she shines specially when the instrumentation is limited. This lets her talent blossom.